Can you help? This page is the result of the best endeavours of all concerned. If you spot a mistake or know of facts to add, or have a better photo, please get in touch using 'Contact Us' (top, right). On Sunday 3rd September 1939, Britain declared war on Germany. Restrictions on travel and a ban on the assembly of crowds were immediately imposed, forcing the Football League to bring the 1939-40 season to an end. A few weeks later, seven regional competitions were introduced, including the South West Regional League. It was a time of great uncertainty for the players, with their wages reduced to a standard flat-rate allowance of 30 shillings a week (equivalent to £75 in 2011), and many found themselves unable to provide for their families. They were forced to find work elsewhere, and because employers were not always prepared to release them, League clubs across the country found it difficult to find a starting eleven for each match. As a result, clubs were permitted to use guest players, often amateurs in local leagues and sometimes professionals who, by then, had joined one of the Armed Services and were stationed in the area. Townsend was one of six players who made no conventional Football League appearances for Argyle, but did play for the first team in the South West Regional League. Born in Brentford, the inside-right started his career with Isleworth Town and then Hayes before signing for Brentford in 1938. At the outbreak of war he joined the Army and was stationed in Plymouth, so Brentford manager Harry Curtis gave his consent for him to play for Argyle as a guest. He began his spell at Home Park in January 1940, having already scored 14 for the Brentford first team that season and 9 for their reserves. After more goals than games for Argyle, including two hat-tricks, he then played as a guest for Leeds Utd in the 1940-41 season, notching up 14 goals in 12 appearances, including a hat-trick in the FA Cup. 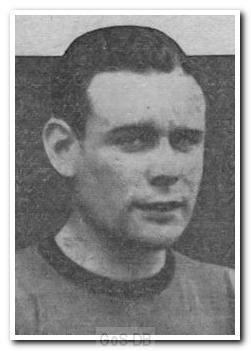 Although the timing is unclear, he also had a spell with Belfast Celtic during the war years, and was selected to represent the Northern Ireland League. Returning to Griffin Park for the interim 1945-46 season he made a further 29 appearances and scored 8 more goals for his contracted club, and whilst still stationed at barracks in Colchester, also made one guest appearance for The Us in January 1946, once again scoring a hat-trick. Having scored regularly throughout the war, it came as no surprise that he was in demand when the traditional League format resumed. He signed for Bristol City in 1947, playing 74 times and netting an impressive 45 goals, followed by Millwall in 1949, and then moved into non-league football with Guildford City, Hayes (again), Slough Town and Maidenhead United. If you can add to this profile, perhaps with special memories, a favourite story or the results of your original research, please contribute here. The details below reflect appearances in all first-team competitions. I'm very grateful to many who have helped write GoS-DB's player pen-pictures, and to Dave Rowntree, the PAFC Media Team and Colin Parsons for their help with photos. Thanks also to staff at the National Football Museum, the Scottish Football Museum and ScotlandsPeople for their valuable assistance. The following publications have been particularly valuable in the research of pen-pictures: Plymouth Argyle, A Complete Record 1903-1989 (Brian Knight, ISBN 0-907969-40-2); Plymouth Argyle, 101 Golden Greats (Andy Riddle, ISBN 1-874287-47-3); Football League Players' Records 1888-1939 (Michael Joyce, ISBN 1-899468-67-6); Football League Players' Records 1946-1988 (Barry Hugman, ISBN 1-85443-020-3) and Plymouth Argyle Football Club Handbooks.